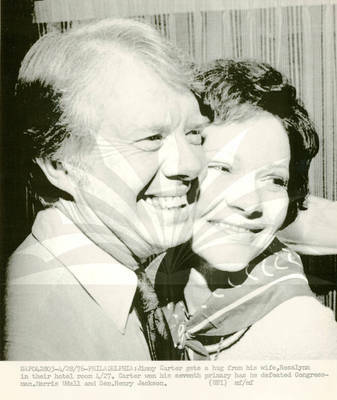 Jimmy Carter gets a hug from his wife, Rosalynn in their hotel room 4/27. Carter won his seventh primary as he defeated Congressman Morris Udall and Sen. Henry Jackson. Black and White Photograph, 8 1/2" x 11"